From traditional to multi-purpose high chairs, Brandenberry Amish Furniture offers you a remarkable collection of chairs to choose from. And Amish artisans build them all from solid hardwood. So you’re assured superior construction, practical designs and long service life. 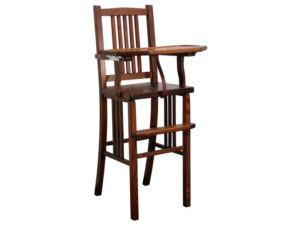 The Comback High Chair has a rich wood finish. Beautiful wood slats and sturdy construction accent the sleek Mission High Chair. 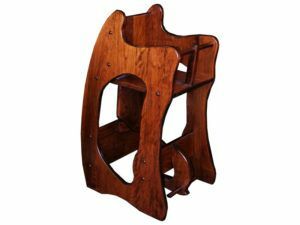 A solid hardwood three-in-one highchair, rocker, and a desk. A versatile piece of children’s furniture able to be used as a highchair, a rocker, and a desk. 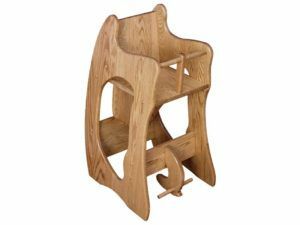 With its solid hardwood construction, great designs and incredible sturdiness, the collection of wooden high chairs for toddlers from Brandenberry Amish Furniture is certain to include your choice for the next high chair for your home. Variety. Notice that the collection includes a number of innovative options. Take the traditional high chairs with spindles. We improve on this tried and proven design by creating chairs that are so sturdy, they can withstand decades of active use. Try this with a bargain-brand chair! You will also notice that some of the traditional chairs come with a mission design. Then there is the three-in-one highchair, rocker and desk. Stand it upright, and you get a high chair. Turn the curve side down, and your child can enjoy rocking back and forth in the chair. Or flip the chair over, and the chair becomes a mini-desk for the little ones. Sturdy construction. Skilled Amish cabinetmakers custom-craft each wooden high chair. And they use solid hardwoods like oak, maple, cherry and hickory. Plus great attention to detail. As a result, the chair you choose should, with proper care, serve several generations of kids in your family. What’s more, with its genuine hardwood grain, the high chair you choose will easily blend with your décor.